Swyft Media helps brands and advertisers become a part of the world’s largest conversation by creating and distributing branded content that consumers want, love and share with friends across a wide variety of mobile apps. Swyft Media’s innovative Mobile Engagement Platform gives advertisers and brands an opportunity to deploy various ad campaigns via popular messaging applications at scale. 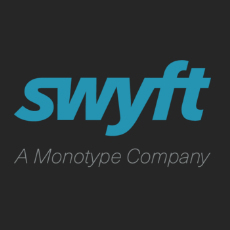 Swyft Media is a Monotype company. Mobile Engagement Platform by Swyft lets marketers quickly and easily launch branded content across mobile messaging apps based on your target audience and goals. Swyft's platform is integrated via existing API’s into our extensive partner network. Simply enter your information to start engaging with your audience. Swyft Media helps brands and advertisers become a part of the world’s largest conversation by creating and distributing branded content that consumers want, love and share with friends across a wide variety of mobile apps. Swyft Media’s innovative Mobile Engagement Platform gives advertisers and brands an opportunity to deploy various ad campaigns via popular messaging applications at scale.